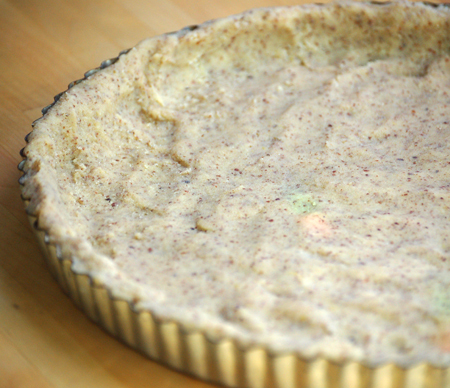 Recently, my friend Karin (Cooking in My Heels) reposted her grandmother's Linzertorte recipe. 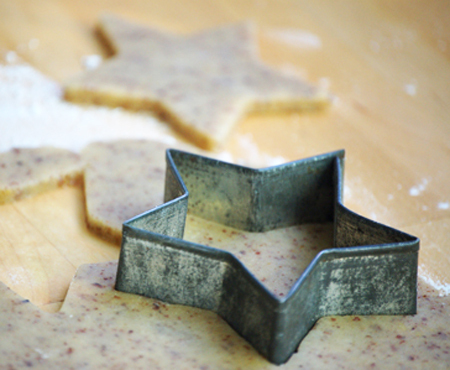 And friend Paula (Vintage Kitchen Notes) posted some really tasty cheddar cheese star crackers. 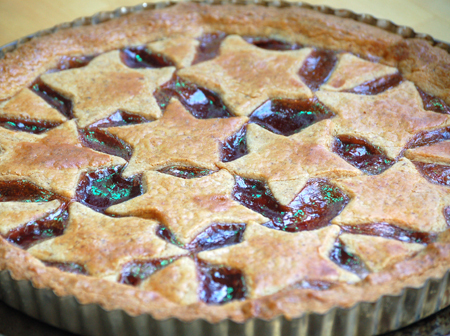 Taking a cue from each of them, I am making my recipe for Linzertorte but, instead of doing the traditional lattice crust, I am giving the tart sparkle by adding stars on top! Stars are important to me, and I love their abundance in our Arizona sky. To look up on new-moon nights is sheer magic. The sky has good bling! 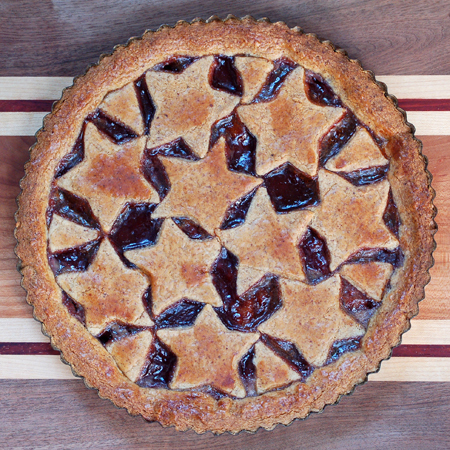 The cut out stars atop the tart are really a nice change from the standard lattice. And, can I be really honest? It is soooo much easier. The crust dough is so tender that it breaks if you look at it sideways. Weaving it is impossible, and even making long strips is difficult. 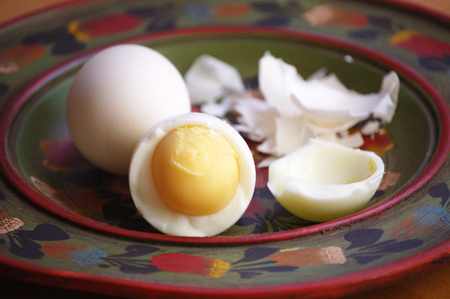 This recipe dates to 1980 when I spent the summer in Heidelberg, Germany, playing in the orchestra for the Schloßspiele Opera Festival, set in the old castle overlooking the Neckar River. The orchestra was made up of my classmates from the Eastman School of Music. They were all fun-loving folk and a tight-knit group, opting mostly to hang out with one another. Only a few of us branched out to meet non-Americans, and learn some German. I started hanging out with the chorus members - all German with a few American expats - who took me out in the evenings to a variety of Biergartens, bars and a few restaurants popular with the locals. Of them, the Plöck-Stube, run by Frau Frei, was my favorite. It was all pink inside, the food was great, and our hostess reminded me of an overpainted character from Cabaret. Sadly, I think it is no longer there. In the afternoons, post-rehearsal, small clutches of us would head out for a pastry and coffee (or cocoa, for me) at one of the many wonderful cafes in Heidelberg. My knowledge of the German language was getting better every day. My favorite cafes included Cafe Scheu, Cafe Schafheutle, and Cafe Markt 7. And it was from Cafe Markt 7 that I, through some impressive Deutsch-English flirting, walked away with the recipe for Linzertorte that I share with you today. I never thought of Linzertorte as a holiday treat. Everywhere I went in Germany and Austria it was served year round. I have often served it at the holidays, though, because the mixture of cinnamon and cloves in the almond crust, combined with the raspberry preserves as the filling, somehow say Christmas to me. After a little research, I have discovered a few things to share. It is, as you may have guessed, from Linz, a city in Austria. And it is, indeed, a holiday specialty! I didn't know it was traditional to make it with hazelnuts (my recipe said almonds, so perhaps that is the German version), and fill it with currant jam, with blackberry, raspberry and apricot jams listed as alternative filings. The key for the filling, by the way, is not to use jam that is too sweet (the currant jam makes sense now). Karin and I agree on this, although our methods differ slightly. If your raspberry jam is too cloying, I suggest you cut it with some unsweetened applesauce. I do find that most artisanal jams are okay as is. One more difference in my tart? I always use seedless jam. If I can't find any in the store, I simply strain it through a fine-mesh sieve. I made the tart you see today for a Christmas Eve dinner with friends. The evening sparkled in so many ways - the love we shared, the food at our table, the silly gag gifts we gave one another, and then our true gift - the biggest sparkle: we all got out our checkbooks and made donations to our local food bank. That one simple gesture finally put me in the Christmas spirit. After all, isn't that what it's all about? 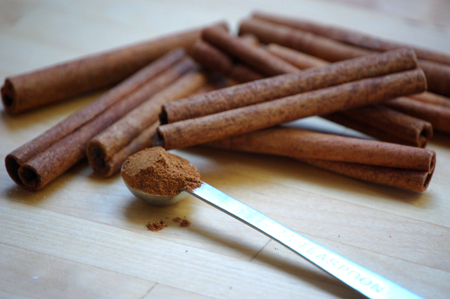 Place flour, almonds, sugar, lemon zest, hard-cooked yolks, cinnamon, cloves, and salt in the bowl of a food processor. Process for 20 seconds. 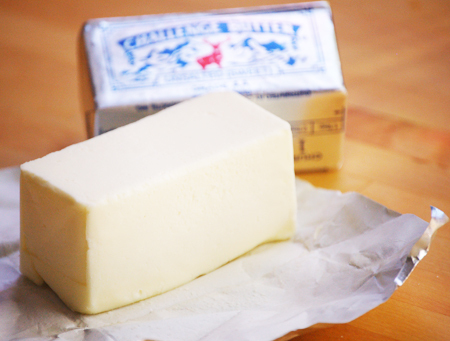 Add butter, raw yolks and vanilla, and process until dough forms a ball around the blade of the processor. Wrap dough in plastic wrap and refrigerate for 2 hours. (Can be made one day in advance). 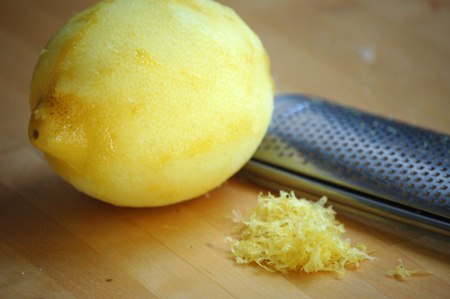 Remove dough from refrigerator 1/2 hour prior to assembling Linzertorte. Take 2/3 of the dough and, using your fingers, press into an 11-inch tart pan with removable sides, making walls a bit thicker than the bottom. 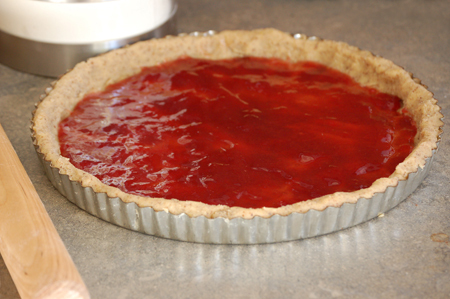 Spread jam (or jam and applesauce mixture) evenly over the dough. 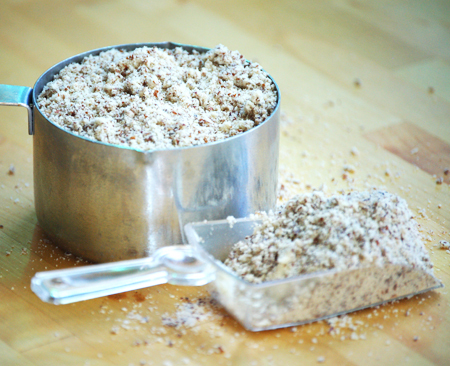 On a well-floured board, roll out remaining dough to 3/16-inch thick. 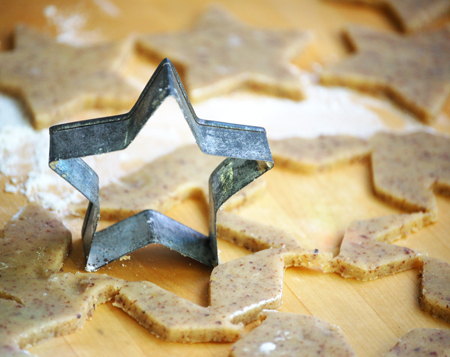 Using a cookie cutter, cut out stars and place them on top of the jam. 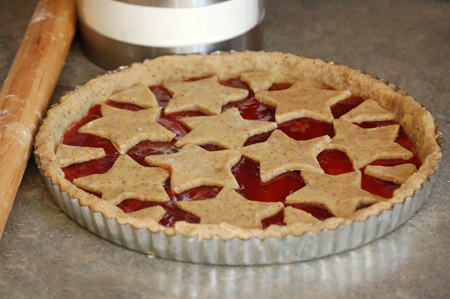 Brush the stars and the walls of the Linzertorte with the egg white wash.
Bake for 40-45 minutes. Let cool. 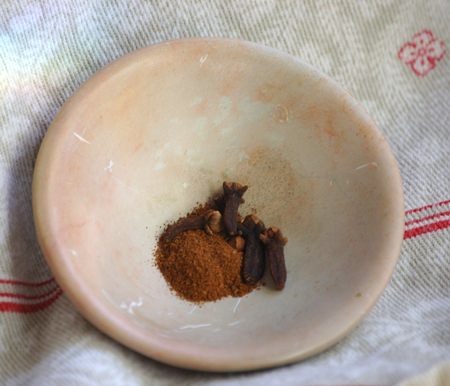 Before serving, remove from the tart mold and dust with confectioner's sugar. Καλή Χρονιά, David!! What a beautiful torte! I love stars too, and yours look beautiful adorning the torte. I've never made this before and can't wait to give it a try. All the best to you and Mark! This looks beautiful, as always David! I was born in Vienna so I have a soft spot for linzertorte. :) happy new year! What a genius idea to use stars rather than lattice! And sretna nova godina from this Australian Croatian from down under! I have a pic at Heidelberg´s castle that´s almost 20 years old...! 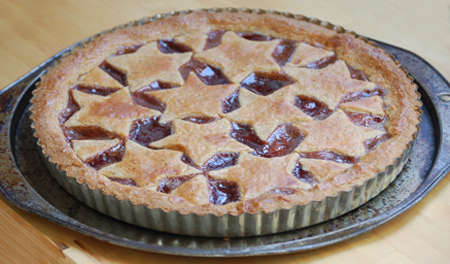 We have a traditional tart here made with pasta frolla and quince jam, very similar to linzertorte. There is a version that uses a wetter dough, sort of a churro dough consistency, so the lattice is piped into neat ropes. 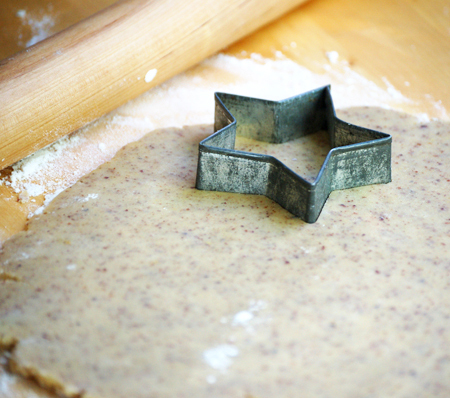 I prefer a tender dough and making stars! Love this cake, especially with a cup of coffee. Hope your beginning of 2013 is the best it can be David! It is really great cooking with you every week. Well now, thanks for the shout out David! I love the idea of the stars (my mom has been doing half moons since I was a toddler), and love even more your collective gift to a food bank idea. Wishing you and Mark eine glückliche wunderbare neue Jahr! David, everything you touch seems to sparkle! Wishing you and Mark the happiest of New Years, with great peace, prosperity and health in the year to come. Ahu - how wonderful to come by your love if linzertorte by birthright! Did you live there long enough to remember it? John - thanks, and I hope your New Year has many adventures that will become our reading adventures next year! Paula - I really hope we can cook together some day, not just virtually! Piping the dough makes sense - I wish this dough could be piped! Michael - you are, as ever - so kind! Thanks for your compliments and for your good wishes! They are returned, with hugs! Thank you, Jennifer! I am so glad you enjoyed this little bit of holiday sparkle! Happy Birthday to you, and we look forward to re-celebrating again soon. I would love to see the Arizona night sky...your writing is just divine, not to mention your stunning photography. Your posts transport me!